My work explores the nuances of masculinity in America. Due to unhealthy societal pressure to exhibit traditionally masculine traits like strength, aggression, dominance, courage and honor, males in the United States objectify not only other genders but themselves as well. This creates something that I refer to as the Paradox of Manliness. Societal objectification can range from body image issues and eating disorders to unhealthy competition, harassment and violence. Pressures to adhere to a specific physical aesthetic leave men feeling inadequate. The expectation to confront the world impulsively and aggressively contributes to a cultural rejection of male emotion. My work depicts a spectrum of un-idyllic masculinity and emotional transparency. The paintings celebrate flesh, body modification, stretch marks, and scars. 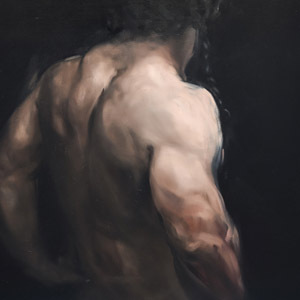 My work is a direct response to this Paradox of Manliness, an acknowledgment of what lies beyond masculine.